Please note that Vedas belong to an era when the only cult, community or religion was that of humanity (another very poor approximate of word Manushyata). While Vedas elaborate on a large number of deep subjects and provide a complete framework to reach up to ultimate levels of bliss and truth, following points summarize what it takes to become followers of Vedic religion. Regardless of one’s knowledge, views, ideology or intellect if she or he follows these points, she or he is following the Vedic religion. If one does not follow any rituals, any tradition or any norms, but adheres to these points, she or he is following the Vedic religion. 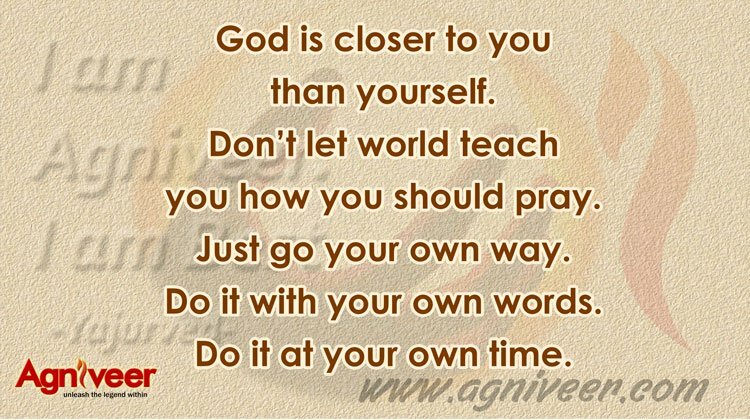 This alone is the religion that Agniveer wants to preach, and this alone is the true and only way to bliss.You would find many of these points common in various cults and religions. That is because Vedas remain the original source of everything good. Whatever is good in these other cults is inherited from the Vedas. Thus if one is following any good practice, it is Vedic dharma. No one can survive without being Vedic for a moment. The effort in life should be directed towards eliminating the unnecessary additional waste that is not Vedic and yet we keep pulling like a donkey. All human beings should follow this religion or Dharma alone and reject everything else that does not comply with it, or are unnecessary additions over it. This alone is the religion for all human beings. Humans do not have two religions. So accept only this religion, as described above, and reject everything else!